We are in the midst of an extraordinary period of computing platform revolution, a renaissance in artificial intelligence (AI), which is going to change the lives of billions of people around the globe. No other technology is gaining more momentum, seeing more progress — or inciting more fear — than the radical sharpening and rise of intelligent machines. While the promise of AI has been known for years, the current pace of breakthrough is stunning. Machines are set to reach and exceed human performance on more and more tasks, thanks to advances in dedicated hardware, faster and deeper access to big data, and new sophisticated algorithms that provide the ability to learn and improve based on feedback. AI has driven crucial progress in fields such as medicine, where it has spurred breakthroughs in disease diagnosis and the development of treatment plans. It has also opened up opportunities in transportation and manufacturing, ranging from autonomous vehicles to sensors that detect product defects imperceptible to humans. These advances are likely to eventually eliminate many manual tasks, everything from driving to window washing. In several areas, such as automated image recognition and AI-powered speech recognition, machines are already leapfrogging human capabilities. This is sparking fierce debates on whether AI will create a more humanistic future or a robotic and cold one; whether it will empower us or replace us. As AI comes to play a bigger role in our future, we are facing profound questions about disruption and economic dislocation. A recent report says AI-driven automation and robotics will open up new opportunities for the economy and society, but also disrupt millions of livelihoods. 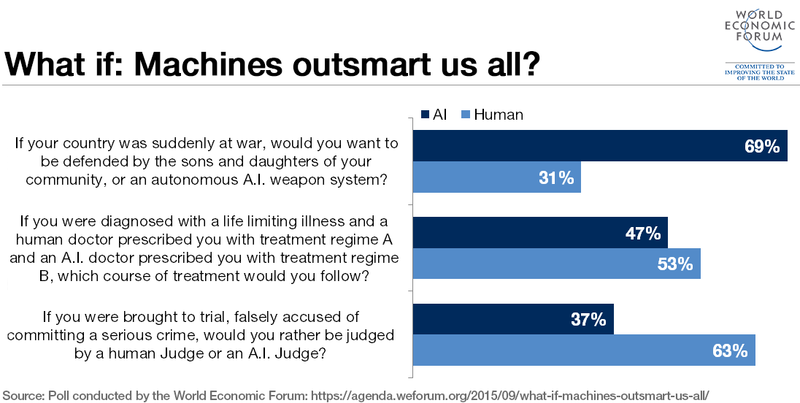 Some are even questioning whether AI poses an existential threat to us. While there are many unknowns, there is also certainty: AI development will affect billions of lives. From an economic standpoint, we often see the discussion of AI broken down into a binary choice between technological progress and negative outcomes, such as elimination of jobs, but the trade-offs are much more complex. Throughout human history, whenever progress has been made, there has been disruption. Overall, technological advance — and the change it ignites — has driven the world forward. 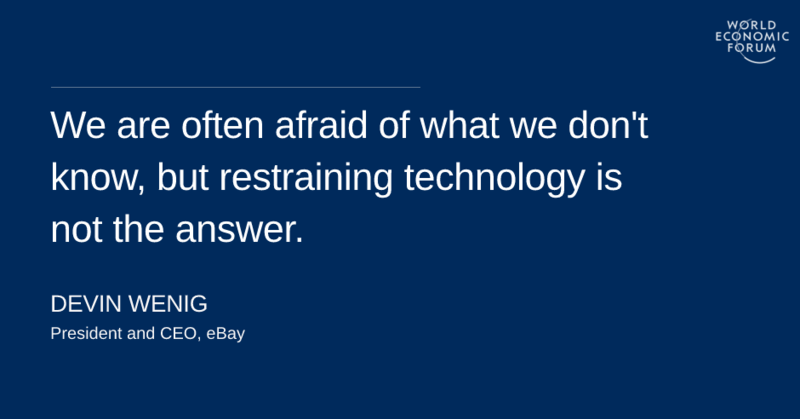 We are often afraid of what we don’t know, but restraining technology is not the answer. While we can’t hold back progress, we can shape it. Preparing today’s workers for the skills of tomorrow is key, as is increasing everyone’s access to the tools of the future. As AI evolves, job training must evolve with it. There are already big shortages in fields closely related to AI, such as data science, engineering and operations. Industries must contemplate the ultimate endgame now. There must be cooperation and control as AI advances or immense power could end up in the wrong hands. Already we are seeing technology groups and individuals coming together to focus squarely on these challenges. The OpenAI project is one example with the mission of ensuring that AI’s benefits are safe and widely distributed. We need such industry collaboration to drive equitable access to this critical technology. Most importantly, we must invest in humanistic AI outcomes. Using the muscle of AI to empower individuals and small businesses around the world is one critical way to do so. Small businesses are the lifeline of any economy and boosting their growth will create new economic opportunities, contribute to local communities and improve quality of life. Technology has already made it easier than ever to be an entrepreneur and to boost growth and create healthy micro-economies, regardless of where you live. eBay supports millions of sellers — many of them small to medium-sized businesses — and I believe that entrepreneurship will grow as AI-driven enhancements create new economic opportunities and help entrepreneurs reach a new consumer base or enable them to hire new workers. For the past five years, we have been investing in AI across eBay to drive foundation improvements across our marketplace. It’s being embedded in our entire platform and distributed across 30 domains — from search to shipping to fraud detection, and risk to delivery time and predictions. We use AI to determine which sellers are most trustworthy and to promote businesses who provide better experiences. AI is embedded in our work on pricing and insights for our inventory. As an example, if we have an inventory gap for left-handed golf clubs on our site, we can alert relevant golf club sellers to stock up and also provide pricing recommendations, given the demand. We are bolstering our offerings and shopping experience with image recognition technology. Our sellers use their own images and words to create listings to show the items they’re selling. With AI, we can infer information based exclusively on visual cues like color and design, which helps us better understand the inventory on our platform and, in turn, provide clearer options to our customers. In many cases, the advances on our platform will be seamless and invisible to business owners, but very powerful in making growth opportunities equitable. Take Tanya Crew , who was a single mother trying to finish college when she first started selling motorcycle accessories on eBay to make extra money. Through the internet and eBay, she built a successful online business and was able to employ two others. In the future, our AI-driven platform technology will help this business optimize item pricing , predict shifts in consumer behavior and more — making small businesses like hers more competitive. Twenty-something Mohamed Taushif Ansari who moved to Mumbai with a dream to start a business creating and exporting leather garments is another great example. With just a sewing machine and a laptop he started selling his products worldwide on our platform. Today he has his own retail brand, an online business that exports to 30 countries, and employs 10 people . Our work on AI will directly help this business to optimize listings and online images featuring varying types of consumer behavior. His products are also now shown to customers on social platforms via our AI-powered eBay ShopBot , which is in beta. The real opportunity we have today is recognizing the role that AI and other emerging technologies play in creating new pathways for equitable growth. We have to reduce the growing global divide between those who feel they are benefiting from the forces of technology, open trade and globalization, and those who feel shut out and left behind. We need serious public policy discussion on the impact of AI on the workforce in the next 10 years, when there will be driverless cars and when nobody will be washing windows. We have to look at the issue through a global lens: what is artificial intelligence going to mean to people in Vietnam, the Philippines, Turkey or Latin America, 10 years from now? The seriousness of that public discourse has to move from the fringe to the forefront. It has to be a focus issue within governments and communities. In the very near future we won’t have the same jobs that we have today, but new jobs will be created. We must empower people with the right education and opportunities. I believe our greatest days are ahead of us, but this rests on embracing our most promising technologies — and shaping them — to lift people up and create opportunity at all levels.